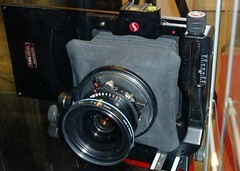 Silvestri is a maker of sophisticated professional medium format and large format view cameras and accessories. It is based in Montespertoli, near Florence, Italy. Most of the Silvestri cameras are designed as modular system-cameras, with most components interchangeable even between different models. Silvestri also acts as a distributor, mostly for accessories (including Lee and Wratten filters, and Horizon lupes) that might be used with their cameras. The firm once sold the KMZ panoramic Horizont cameras, both the Horizont 202, rebadged as the Pan-35 SL, and the Horizon 205, rebadged as the Pan-120. 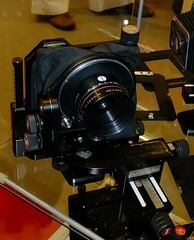 A digital panoramic camera, the Horizon D-L3, was described as a joint venture between KMZ Zenit and Silvestri, and shown at Photokina 2010. The camera is not offered for sale in the online sales page of Silvestri's site, and it is not clear that it was ever manufactured in quantity. 4"×5" view camera specifically designed for wide-angle photography, with digital, sheet-film or roll-film backs. Currently produced is the Bicam II model, an improved version of the original Bicam. 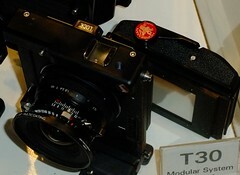 A model Bicam II NK with Nikon lens bayonet also existed but is now discontinued. Technical view camera with high-precision micrometric movements control for use with digital backs or 6×7/6×9/6×12 roll film or Polaroid backs. 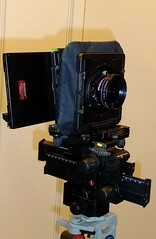 4"×5" view camera dedicated to studio and outdoor film photography. 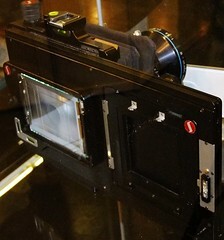 4"×5" view camera with incorporated telescopic eye-level viewfinder. 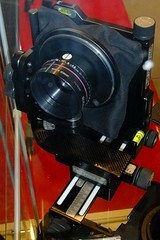 The viewfinder can be equipped with frame format masks and the mask moves up and down following the lens shifting. Model H and H25 differs only by the vertical lens shifting amount. ↑ Horizon D-L3 overview at Silvestri. ↑ Horizon D-L3 at Photokina 2010, reported at ephotozine. This page was last edited on 14 November 2015, at 13:19.